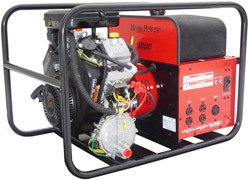 HOME POWER® Tri-Fuel Portable Generators by WINCO keep you out of the dark. The unit operates on gasoline, L.P. gas, or natural gas, and converting from one fuel source to another can be accomplished quickly and easily. Premium Honda and Briggs & Stratton Vanguard OHV engines meet EPA emissions standards. Low oil protection helps prevent costly repairs and downtime. Standard electric start with battery rack and cables (battery not included). Maintenance free electronic ignition system. Capacitor excitation for brushless operation.